Cindy Walton, a native of St. Petersburg, Florida, is a long-time resident of Asheville, North Carolina. A committed artist from childhood, Walton earned a baccalaureate degree in art from Salem College, Winston-Salem, North Carolina, and a bachelor of fine arts degree from the University of North Carolina at Asheville. The warmth and effervescence of the Florida coast and the quiet energy of mountainous Western North Carolina are both strongly evident in her work, in imagery as well as in coloration. She has developed highly personalized techniques that translate and transform nature and iconography. As a result, her paintings, whether abstract or figurative, are transformative interpretations rather than literal renderings. She is particularly expert in the use of cold wax methods and is highly respected as a teacher of the medium. 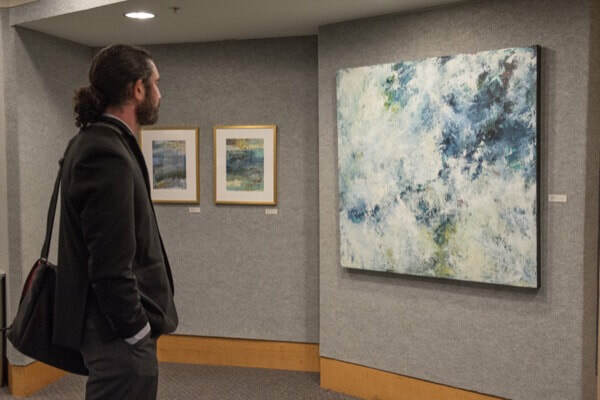 Cindy has had a number of one-person exhibits across the southeast; solo venues include the Asheville Area Arts Council and the Johnson City (Tennessee) Area Arts Council. Her work has been exhibited at the Asheville Art Museum, South Cobb (Georgia) Arts Alliance, Florida’s National Vernissage des Femmes Artistes exhibit, various colleges and universities, and elsewhere. Walton is a recipient of a Virginia Center for Creative Arts fellowship (Amherst, Virginia) and also of a North Carolina Arts Council Regional Artist Project Grant. She is available nationally as a teacher, most notably in Asheville and at Ghost Ranch in Abiquiu, New Mexico. Her work is in the collections of City Bank Corporation and other entities and in numerous private collections.